The Columbia Room. Photo credit: Max Cook. Imagine a little room removed from the crazy world outside – an oasis of peace entered through a busy bar. Jars of spices line the walls, while chunks of the most pristine ice you’ve ever seen are gently melting in a wooden hangiri bowl, waiting to be carved up. Bottles stand neatly at the ready, watched over by a dapper gentleman sporting a perfect bowtie. This is the Columbia Room, and for a few blissful hours prepare to be transported to drinks nirvana, as Derek Brown brings you a “cocktail club” nestled inside The Passenger. It’s like a spa for spirit lovers, evoking a true intimacy almost lost to us in these hectic times. I’ve been eager to try out the Columbia Room since I first heard whispers of its concept, unintentionally eavesdropping on co-owners and brothers Tom and Derek Brown before The Passenger ever opened, and it’s no secret that later The Passenger quickly became one of my favorite bars. So it was with much anticipation that I finally entered this gentle yet meticulous environment on two occasions last week – once for a class and once for service – and I can’t think why I wouldn’t be back again and again. As with The Passenger, there’s no attitude here. All you need to get in is to find a open slot on the online reservation system and hold it with a card. You’ll be called ahead of time to confirm and review any preferences. There’s a four person maximum to each reservation, and the prixe fixe menu of $49 (tax and tip inclusive) includes a welcoming glass of champagne, the nightly cocktail paired with a small plate, and a customized cocktail. 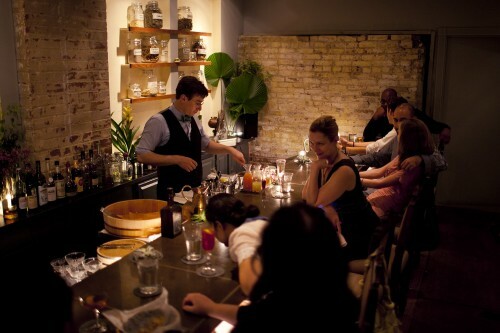 There are also weekly classes by Derek Brown and Kat Bangs for $65 covering all aspects of crafting cocktails. I had a wonderful time at Kat’s recent champagne cocktail class, learning how to make my own blackberry liqueur and sugar cubes. Both service and class are well worth it. Derek Brown at the Columbia Room. Photo credit: Max Cook. Fellow WLDC author Max Cook and I certainly needed decompressing as we entered the quiet antechamber from the hot rainy monsoon outside. Shoes soaked and more than a little stressed, I was instantly relaxed by the sweet mise-en-scene – a desk serving as register, a private candlelit restroom, and a gentle reminder to enjoy myself and silence my cell phone. It’s a small ritual that reminds you it’s time to cast care aside. Inside is very intimate, about 18 seats in total. If you aren’t directly at the bar there are platform seats raised to allow you to still see the action. Derek Brown is presiding at bar – slicing and shaving, poking and chopping each piece of ice which is individually worked for the needs of a particular drink. It’s a mesmerizing display. Lighting is dim, music is mellow, conversation is a lull. Cucumber water is served to cleanse the palate, and a glass of Henriot champagne is poured to start your experience off gracefully. Derek is mixing up the first round of cocktails, changed every week based on season and ingredients. 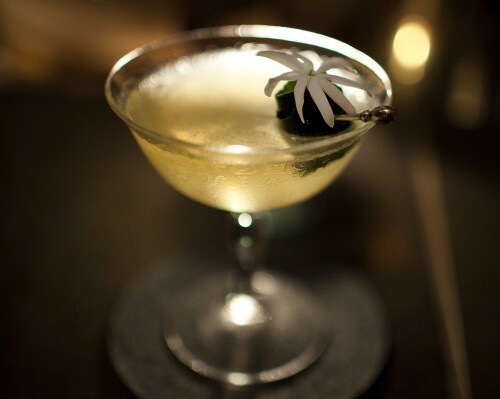 Last week featured the Taiwanese Lady, and I was salivating watching him prepare it – Martin Miller’s “Westbourne Strength” Gin, Yellow Chartreuse, Grapefruit Juice, housemade Lemon Bitters, with an exquisite garnish of rolled cucumber skin topped by a jasmine flower. Derek quietly lines up the bottles used in front of you when the cocktail is being made, a thoughtful touch that accentuates the learning experience without hitting you over the head. He tastes every drink with the delicate silver spoon before serving it, another thoughtful (and thoroughly necessary) gesture. Then, it’s over to you in a lovely glass. Taiwanese Lady cocktail at the Columbia Room. Photo credit: Max Cook. The Taiwanese Lady is heavenly. I breathe in jasmine’s floral delicacy first before the other ingredients waltz in my mouth. It’s as elegant as a vintage silk georgette dress. Yes, sorry, this is one of those drinks that drives me to ridiculous metaphor! It’s paired with a refreshing gin-based cold soup with the aroma of angelica (in another thoughtful touch, the creme fraiche I can’t eat has been left out for me without my having to remind anybody). Part of the fun of the Columbia Room is being hypnotized by Derek’s preparation methods. He’s constantly cleaning his bar, reminding me of a Japanese master sushi chef, extremely meticulous about cleanliness – he even washes the ice before it’s placed in that wooden bowl. The bar is so neat it somehow reminded me of being in the presence of a dapper Victorian chemist. 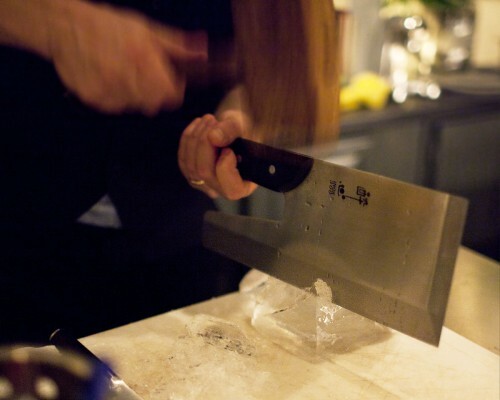 The constant ice preparation is a reminder of the intense skill involved – with all these sharp Japanese knives, one false move could be disastrous. Chopping ice with an udon noodle knife at the Columbia Room. Photo credit: Max Cook. And then there’s that shake. Uyeda uses three tiers and four beats for his shake, but for Derek it was more natural to use three beats in an inverted triangle. By using a specific rhythm he can hear the action of the ice in between beats, and easily replicate the rhythm. It’s “much like learning a dance move to music,” he says, helping him apply the shake both accurately and uniformly to the specific cocktail. I completely agree, and of course bar as theater combines two of my favorite things. Time for the next round – the historic Seelbach. Seelbach cocktail at the Columbia Room. Photo credit: Max Cook. As Derek prepares this beautifully colored cocktail I realize how adept he is at paying attention to people’s preferences, because this one is Jenn Nirvana – featuring Bourbon, Orange Curacao, Peychaud’s Bitters, Angostura Bitters, and Champagne. 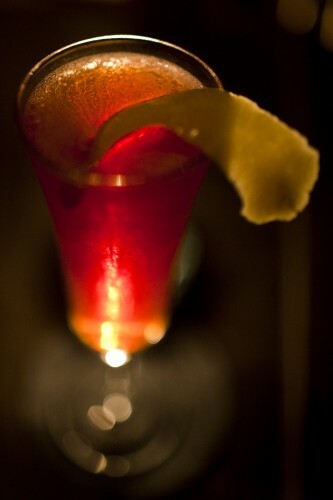 That’s seven dashes of Peychaud’s and seven dashes of Angostura, to be precise. Combining champagne and bitters equals absolute bliss for me. We chat about bitter as a flavor and Derek notes it signals the brain in two ways – wait, this could kill you, but it’s so good. Ah, so that’s why I love bitters! Max is waxing poetic over his perfect gimlet, the ice floating in the center poked through so many times it looks like an asteroid. Derek has to remind him to drink it, it’s so beautiful. We’re giddy with our second round and don’t want the experience to end. 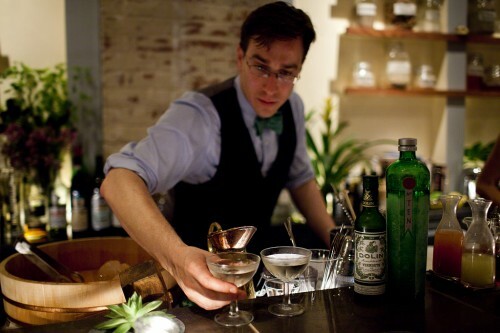 So Derek sends us off with the ultimate classic – the dry martini. 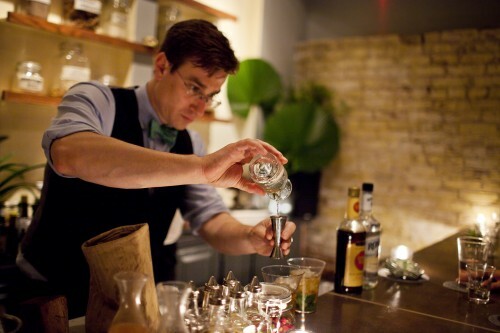 Derek Brown serving up dry martinis at the Columbia Room. Photo credit: Max Cook. This is a deceptively simple cocktail – Tanqueray 10 and Dolin Vermouth. Derek pulls out a thermometer and tests our drinks until they are the perfect temperature, between 29-31 degrees. Is it all for show? Absolutely not. This made for the best dry martini I have ever had. Everything came through perfectly – the complexity of all the flavors present in the gin, plus the elegance of the vermouth – it erased from my mind former bastardizations of that classic drink, which is precisely the point. Indeed. Those who want to keep this little spot a secret may hate me for writing about it, but I think this isn’t an erudite experience for the few. Part of my goal in writing about drinks for you is to urge you to explore the exquisite beauty of a well-crafted cocktail and to appreciate the perfection of balanced ingredients. Combine that with an environment that challenges perceptions while being welcoming and gracious? Bravo. The Columbia Room is open for nightly service Thursdays through Saturdays, and for classes Tuesdays and Wednesdays. Advance reservations and registration online. Many thanks to Derek Brown and Kat Bangs, and to Max Cook for photographing the fun. I am also a fan of the Passenger (my wallet is thankful we live father than a walk away) and had been anxious to visit the bar within the bar. We went to the Columbia Room for my birthday a few weeks ago. It was perhaps The Best. Birthday. Ever. As someone who has acted at Warehouse Theatre, the transformation of the old dressing room to the sleek, quiet bar was stunning. We were (for all but the first 15 minutes of our reservation) the only 3 guests. The service is impeccable. They have an amazing sense of when to hang back and when to join the conversation. Derek and Kat were patient with our cocktail geek questions and fawning. We talked about the needed items for our friend’s new home bar, the not so needed additions for our home’s amateur mixologist bar, the “new” Noilly Pratt vermouth, homemade cherries, and what got us all of us interested in cocktails. Oh, and a long discussion about making clear ice. As we left, we decided it’s good my birthday is 6 months from my boyfriend’s: that gives us an excuse to visit twice a year and see how things change with the seasons.